A well attended AGM on the morning of 21st May 2017 was followed by a workshop on “Mixing Greens” by Jeni Neale. Exhibition – Northamptonshire Botanical Artists Society have an exhibition -Botanical Treasures at:- The Charles Rennie Mackintosh House, 78 Derngate, Northampton. The exhibition is on now until 15th July. Sigrid Muller – Work by Sigrid Muller was on show recently at Fosse Gallery in Stow-on -the-Wold. I found this approach to botanical art interesting, pencil crayon on backgrounds of pooled watercolour. The work can be viewed on the web site or galleries exhibiting the paintings. 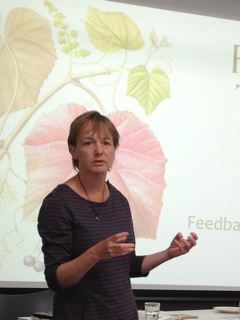 On 23rd April we enjoyed an excellent workshop entitled “Finishing Touches” given to us by Julia Trickey. Julia went through what makes a good painting. We did exercises in tonal variation using graphite, colour exploration – mixing paint to match the colour of flowers and composition. This practical workshop was accompanied by a powerpoint presentation and Julia passed on many tips to us. Wednesday 12th April members were once again at Castle Bromwich Hall Gardens to draw in the garden and were pleased when some visitors joined us. We will be there again on the 10th May. Account of visit by Jane Edwards. Those of us that went to Liverpool had the best of days. We laughed at how daft we could be and how entertaining travelling by rail could be – intentionally or otherwise. We are all looking forward to the next outing but please do not let me suggest booking flights…. 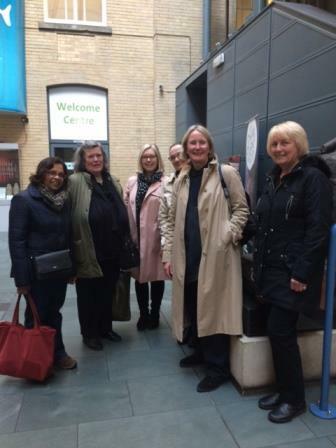 History – Years ago some of us went to the same museum to an exhibition (Edward Lear bird paintings in 2002). The Society made a small donation to the Museums Atrium appeal to purchase a tile so imagine my delight to see a plan of said (floor) tiles at the museum entrance with our name against number 211. One of the security guards took our photograph standing on our tile. The Herbarium – We were introduced to the collection by Wendy Atkinson Assistant Curator. Wendy took us on a speedy tour of the several thousand specimens they hold ranging from Mersey seaweeds to samples collected on Cook’s voyage to New Zealand. Various seedpods were there to be handled and hundreds of reference books to be enjoyed. They hold the British Pteridological Society’s collection of fern nature prints and Michael Hayward, the visiting curator showed us part of the collection. After lunch Wendy brought out several volumes of books one of which contained 321 original Georg Ehret paintings, delicate images as fresh as when they were painted. We were able to scrutinise and enjoy these volumes freely – close to the spirit of the C18th. A relaxed painting day at Stirchley for 25 members. The RHS Botanical Art Exhibition takes place at Lindley Hall on 24th and 25th February, also worth a visit is the exhibition by Jessica Shepherd at Abbott and Holder on Museum Street. Rosie Sanders’ – Flowers A celebration of Botanical Art. This is not a book on techniques more of a ‘coffee table’ book. Based on her recent paintings of enlarged flowers the images are very beautiful and the large photographs of parts of the flowers and leaves give an insight into the colours she has used to depict the specimens. Really recommend this book. Plant – Exploring the Botanical World. Another ‘coffee table’ book with 300 botanical images of paintings, photographs, medieval manuscript paintings and micrograph scans. A book to browse through when there is nothing on the TV. Our programme for 2017 began with a workshop by Billy Showell. 15 members were instructed on painting a cyclamen leaf and flower. Comments following this session include “Billy’s workshops are inspiring”, “a great day”, “a great tutor”. In a separate room other members enjoyed a quiet time away from routine to concentrate on current projects. The Society is delighted to announce the beginning of a year long drawing project at and in conjunction with Castle Bromwich Hall Gardens. 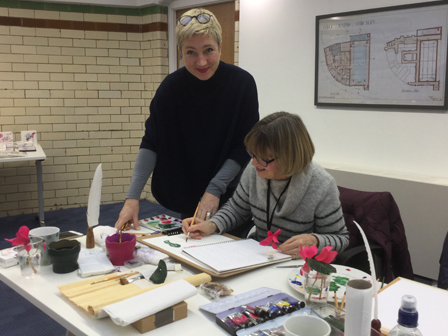 Normal garden entry charges will apply otherwise the sessions are free to anyone who wishes to join us and be guided by experienced botanical artists. http://castlebromwichhallgardens.org.uk/ The first session will be on Wednesday 8th February and continue on the second Wednesday of every month thereafter 1.30 to 3.30. You will need suitable clothing (we will be outside for all or some of the time – indoors if weather bad) and bring some basic drawing tools – paper, sketchbooks, pens/pencils and perhaps a folding seat together with a willingness to observe aspects of the garden and make drawings of what you see. We will meet at the till point where Jane Edwards, BSBA will meet you and take you into the garden.